Pen-and-ink plan of the fort at Gurramkonda in Andhra Pradesh with a key and notes, by Thomas Fraser (1776-1823). 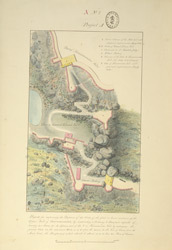 Fraser served with the Madras Engineers from 1796 to 1819; this is one of a series of plans completed, c.1802 when he appears to have been inspecting and surveying forts in the Ceded Districts of Bellary, Kurnoo, Anantapur and Cuddapah. The fort, supposedly built by the Golconda Sultans, stands on a hill which is 500 feet high with three almost perpendicular sides. Fortifications guard every assailable part of the hill while a long wall, curving and winding through the rocks connects the upper with the lower fort. According to local legend Gurramkonda (‘gurram’, horse and ‘konda’, hill) was named because a horse was believed to be the guardian of the fort rendering the place impregnable so long as the horse remained there. The story goes that a Mahratta chief eventually succeeded in scaling the precipice and in carrying off the horse and although the thief was captured before reaching the base of the hill, the spell was broken and the fort when next attacked, fell.